This Article references MC146001 “A new TLS certificate is coming to Exchange Online” which you should find in your Office 365 Message center. You may be running in Hybrid mode or have an inbound TLS configuratiion using Exchange Online and noticed that you have a sudden build-up of inbound messages toward your on-premises Exchange servers. Starting on the 3’rd of August, Exchange Online has updated the certificate used for services including TLS. If your Exchange servers are unable to verify the validity of the new certificate due to firewall lockdown and other restrictions, your mail flow will stop, with queues building up in the online segment of your organisation until Exchange on-premises (or other mail servers on-premises) are able to resolve the online certificate. Modify firewall rules so that Exchange servers that are Exchange online Facing are able to resolve the certificate Revocation List (CRL) on the three hosts noted above. 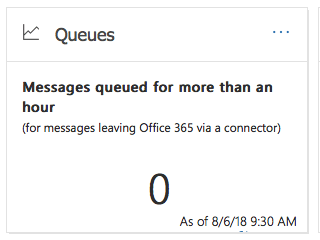 Navigate back to https://protection.office.com/#/mailflow/dashboard and check that the queues are clearing.